This Week's Bombing Of A Polio Center In Pakistan Is Not An Isolated Incident : Goats and Soda The bombing in Quetta, Pakistan, is the latest of several attacks on polio vaccination centers. We asked an expert to put the incident in context. 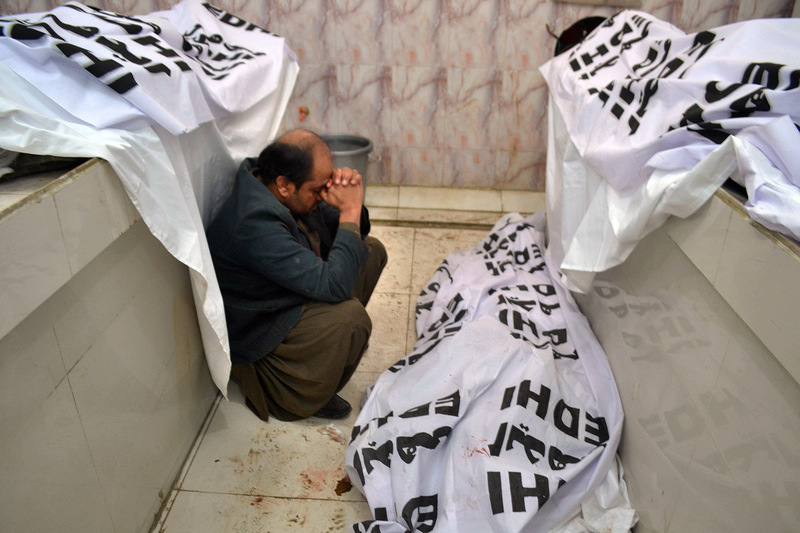 A Pakistani mourner sits alongside bodies of blast victims following a bombing near a polio vaccination center at a hospital in Quetta. Just last month, polio experts were wondering if the tipping point for bringing an end to the crippling disease was near, with cases having further declined in the only two remaining countries not yet free of the infection, Pakistan and Afghanistan. But earlier this week, a suicide bomber's blast outside a polio eradication center in Quetta, Pakistan, killed at least 15 people. According to reports, most of the dead were security personnel assigned to protect health workers as they began a planned three-day door-to-door vaccination campaign. A little-known militant group called Jundullah, or Army of God, claims responsibility for the attack and has threatened more attacks on polio teams. And this is not the first time terrorist groups have targeted polio workers; more than 60 workers have been killed in Pakistan since 2012. How come? We asked Joel Charny, who works on humanitarian aid policy at the nonprofit advocacy group InterAction, to explain. Why target polio centers and workers for attacks? There is a history of trying to disrupt polio campaigns. They are viewed by the Taliban as an intrusion into traditional society, and vaccination campaigns are fundamentally run and organized by central governments [as in Pakistan] that are contrary to the ideology of these militant groups. There is also suspicion of the vaccination itself as something from the outside. There are misinformed, nefarious beliefs that this is a medical plot by the West. This was compounded by the CIA's actions five years ago [creating a fake hepatitis vaccination program to help locate Osama bin Laden]. I think why now is impossible to answer. There is nothing in particular in the environment that provoked the attack at this moment. This is something that has been ongoing sporadically — and I emphasize sporadically — by militant groups in Pakistan and northern Nigeria. Do you expect more attacks? Because of the nature of global communications, the fact that this is taking place in Pakistan is known, and there might be copycats. I don't mean to imply that something will happen tomorrow. But we know that similar attacks have taken place in northern Nigeria. In areas where there are militant organizations with similar ideologies, you might see more. What is the impact of such attacks on immunization efforts? If you're one of the vaccinators, there will be a natural sense to ask: Do I have the courage to go forward? And I would say that what is most striking is just the incredible will of the vaccinators and their determination to continue these campaigns, in spite of these attacks. If there is anything that should be highlighted, it is the determination and that courage that the local vaccinators have. They continue because they understand the importance of these campaigns, that to eradicate a disease you need 100 percent vaccination coverage. Most of the workers are going to be from the community — they know the risk, the dangers. They are the unsung heroes.